Every edition of Pro Mobile is packed with articles, reviews and opinions all specifically aimed at mobile DJs, and Issue 76 is no exception. There’s everything from light-hearted opinions to serious advice and creative ideas. 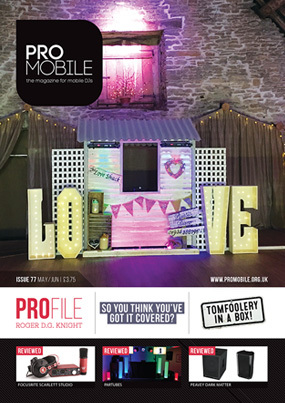 The cover features Roger Knight’s distinctive ‘Love Shack Rustic Disco’ setup and in the magazine there’s a Profile article that tells Roger’s interesting mobile DJ story. Having been a part-time DJ since the ‘70s, it is only recently that he has set about building a full-time business, taking a very different route to his contemporaries. On the review front we’ve got a diverse collection of equipment covered, with detailed reports on headphones, speakers, an innovative lighting effect and even a podcasting/recording kit. In his first article for Pro Mobile, Birmingham-based DJ Rob Sealey discusses the importance of planning ahead and being ready for when disaster strikes. Because, according to Murphy's Law - anything that can go wrong, will! Mastermix's Label Manager Richard Lee takes a light-hearted look at one of music's longest standing institutions, the cover version. Harry Kilb introduces a fun concept for adding to the atmosphere of any party and also keeping the fun focussed on the dancefloor all night long. Greg Cartwright draws together the views of a group of leading DJs to present the arguments for and against upsells. A list of the best songs for packing a dancefloor from the 'swinging sixties' as voted for by Pro Mobile readers. A detailed report from this year's fourth annual Pro Mobile Conference. If you were there, relive the fantastic two days at Heythrop Park; if you weren't, find out what you missed! More mobile DJ-related musings and anecdotes; this time Richard talks trailers and the importance of double-checking event details. Eddie Short, Greg Cartwright, Harry Kilb, James Humphrey, Mark Walsh, Richard Lee, Richard Linton, Rob Sealey, Roger D.G. Knight and Roger Ferguson.